From the river’s edge down valley in the red rock canyon… to beautiful mesas creeping up toward 14,000-foot peaks… to quiet subdivisions… to authentic Colorado ranches… the diversity of houses, condos, lots and ranches offered in the region cannot all be found in one county in many other places in America. The region offers buyers options that allow them quick and easy access to Telluride and Mountain Village while expanding their choices beyond the resort area. Simply traveling through the region, many opt to move here and choose the true mountain lifestyle investment offered in Telluride and Mountain Village. The region includes much of San Miguel County and the heart of the northern San Juan mountains. Because of its large differences in elevation, the San Juan mountain range includes almost every temperate zone found in America… from arid, desert climates to high-mountain tundra usually found only in the Arctic. The sun also plays a dramatic part… a south-facing slope can have completely different temperatures and vegetation than a north-facing slope. The Telluride region is also very unique in that there are no other major destination ski resorts where single-family 35-acre parcels can still be purchased within five minutes of skiing and other resort amenities. There will be very little future development available due to San Miguel County land-use restrictions and the abundance of National Forest… these large home sites and ranches are going quickly. The region offers buyers options that allow them quick and easy access to Telluride and Mountain Village while expanding their choices beyond the resort area. Simply traveling through the region, many opt to move here and choose the true mountain lifestyle investment offered in Telluride and Mountain Village. The region includes much of San Miguel County and the heart of the northern San Juan mountains. Because of its large differences in elevation, the San Juan mountain range includes almost every temperate zone found in America… from arid, desert climates to high-mountain tundra usually found only in the arctic. The sun also plays a dramatic part… a south-facing slope can have completely different temperatures and vegetation than a north-facing slope. The Telluride region is also very unique in that there are no other major destination ski resorts where single-family 35-acre parcels can still be purchased within five minutes of skiing and other resort amenities. There will be very little future development available due to San Miguel County land-use restrictions and the abundance of National Forest… these large home sites and ranches are going quickly. 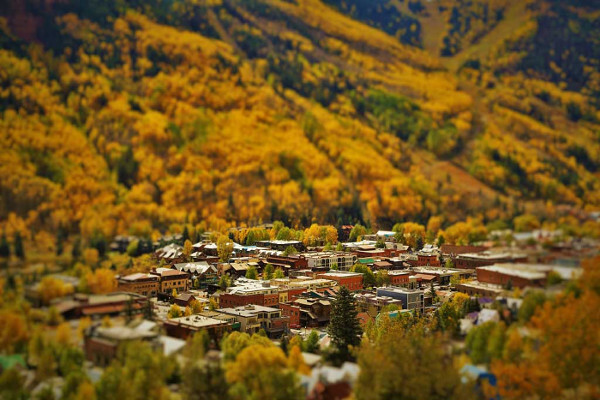 Telluride, Colorado is a unique location for prospective homeowners. This quaint town offers what few other towns in the U.S. can. This beautiful town features a well-preserved national historic district, a European-style mountain retreat with charming, ski-in/ski-out homes, and more. With all of these features nestled among picturesque views of the Colorado Mountains, it is no surprise that luxury homes for sale in Telluride move quickly. Property in Telluride is ideal for a wide range of buyers and is highly sought after. Luxury homes for sale in Telluride attract attention from prospective home buyers who are considering relocating to the cozy mountain town, as well as though looking to own a private, relaxing vacation home. These homes are generally located conveniently to the unique Telluride downtown which features a charming variety of restaurants, cafes, and shops that you cannot find anywhere else. These residences are also convenient to the many music and arts festivals that come through the area annually. Telluride, Colorado is a unique location for prospective homeowners. Real estate in Telluride attracts attention from a wide variety of prospective buyers. The unique town features a number of appealing features. Visitors and residents alike are charmed by the well-preserved national historic district of the 60’s mining town. The European-style mountain retreat with charming, ski-in/ski-out homes, and more attracts the interest of people looking for a thrilling nightlife, cultural and arts festivals, and a proximity to all of the natural wonders of the Colorado Mountains. Real estate in Telluride attracts attention from prospective home buyers who are considering relocating to the cozy mountain town, as well as though looking to own a private, relaxing vacation home. These homes are generally located conveniently to the unique Telluride downtown which features a charming variety of restaurants, cafes, and shops that you cannot find anywhere else. Residences in the area are perfect for homeowners who want to be close to the nightlife and festivals that thrive in the town and to the great outdoors. Real estate in Telluride attracts attention from prospective home buyers who are considering relocating to the cozy mountain town, as well as though looking to own a private, relaxing vacation home. A skilled Telluride broker is able to help prospective residents find the luxury home that best suits their needs. These homes are generally located conveniently to the unique Telluride downtown which features a charming variety of restaurants, cafes and shops that you cannot find anywhere else. Residences in the area are perfect for homeowners who want to be close to the nightlife and festivals that thrive in the town and to the great outdoors. A Telluride broker is the best source of information on real estate available in the charming Telluride area. A broker is able to help you tailor your residential search to only homes that suit your needs and interests, whether this means seeking a home that is closer to the Telluride historical district, a unique ski-in/ski-out condo, or a home that is more readily open to the picturesque natural scenes of the Colorado Mountains. Telluride, CO real estate is highly sought-after property. The charm of the historic mining town lures prospective buyers that are interested in vacationing in the unique European-style retreat, as well as those interested in relocating to the picturesque Colorado mountains. With a variety of features and activities in the town ranging from a thrilling nightlife and annual arts festivals to outdoor adventures, many people are able to find the ideal luxury home to suit their needs. A broker who is well acquainted with Telluride CO real estate can help prospective homeowners find the property that is the best fit for their interests. The luxury homes in Telluride are often conveniently located to all aspects of the historic mining town’s existence. Residents are close to the beautiful downtown area which features shops, cafes, and restaurants unique to the area, as well as the slopes and trails that lure the adventurists. This charming town provides the perfect blend of relaxation, culture, and nature. Telluride Colorado real estate attracts many potential buyers. The luxury homes, mountain retreats, and elegant ski-in/ski-out condos demand the attention of both buyers who are interested in relocating to the charming mountain town and those who want a relaxing vacation home in the quaint get-away. The European-style mountain retreat provides the perfect blend of relaxation, nature, and culture to lure anyone to its streets. The unique downtown of Telluride is a national historic district that still preserves the traditional aspects that grew up around the town’s mining community. The town also features a number of shops and restaurants that are unique to the area. Music and film festivals travel to the area annually, drawing the attention of tourists and residents alike. Of course, many residents are attracted to Telluride Colorado’s real estate for the proximity to the picturesque mountains. The natural surroundings are perfect for hiking, biking, and skiing in the Colorado Mountains. With all of the charm and attractions in the area, it is no surprise that a Telluride condo for sale will attract a large amount of interest. The Telluride area is the perfect haven for buyers who are interested in relocating to a relaxing mountain town, as well as those who are interested in owning a vacation home in the picturesque retreat. Many people are drawn to Telluride for its blend of culture, nature, and relaxation. Each year, music and film festivals bring excitement to the charming town. Tourists and residents alike enjoy the natural surroundings of Telluride; the Colorado Mountains are the perfect backdrop for hiking, biking, and skiing. And of course, Telluride’s unique downtown provides a one-of-a-kind experience as people explore the shops and restaurants of the national historic district. A Telluride condo for sale is often positioned perfectly so that the prospective resident can take advantage of all that Telluride has to offer. Telluride land is the perfect solution for individuals seeking to build a permanent residence or vacation home in a relaxing mountain town. Nestled in the picturesque Colorado Mountains, Telluride has retained all of the old world charm of a historic mining town while adding the intrigue and excitement of a vibrant vacation destination. Telluride, Colorado is a beautiful destination that offers the perfect blend of outdoor adventures, culture, and relaxation. Visitors and residents enjoy taking in the unique shops and the thrilling nightlife. People are drawn from all over the country to experience the impressive music and film festivals that Telluride holds each year. Telluride is also the perfect location for hiking, biking, and skiing in Colorado. Telluride land offers land buyers the opportunity to construct the perfect mountain retreat or luxury home in the heart of the mountains, yet convenient to all of the unique and charming amenities of town. Recognized for its expansive and luxurious real estate, Telluride CO captures the attention of prospective buyers who want to invest in relaxation, elegance, and adventure. Telluride represents both a treasured piece of the area’s history as well as the spirit of adventure and relaxation. People are drawn to the historic mining town by its old world, European-style buildings, its national historic district, and the beauty of the surrounding Colorado Mountains. Both residents and visitors enjoy the unique shops and restaurants found in the downtown area and the annual film and music festivals that are hosted in the area, as well as all of the hiking, biking, and skiing afforded by the natural surroundings. Whether prospective buyers are seeking a permanent residence in the area or a luxurious ski-in/ski-out condo, real estate in Telluride CO offers all of the amenities and conveniences that anyone could possibly want. Telluride is a unique location in Colorado that draws the interest of many prospective buyers. Whether buyers are seeking a permanent residence in the historic mining town or a vacation condo near the renowned slopes, Telluride luxury homes for sale always draw attention. These homes are prized for more than their beautiful architecture, spacious living areas, and elegant fixtures. The majority of the cozy residences and lavish condos in the unique town are located conveniently to all that Telluride has to offer. The town’s historic downtown is easily accessible, as are the unique shops and restaurants, the notorious slopes, and hiking and biking trails. Combined with the incredible layouts, architecture, and elements of the residence, these homes create the perfect atmosphere for relaxation after a long day taking in the town or the slopes. Telluride luxury homes for sale are the ideal vacation home for visitors who want a more personal experience in the area. These homes are also perfect for those looking to become permanent residents of the charming mountain town.